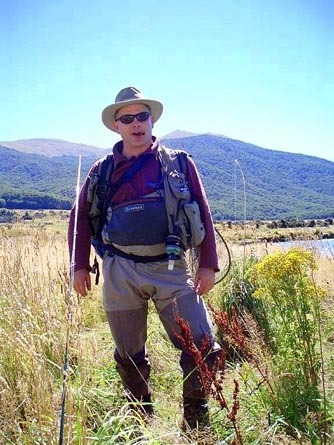 Need a South Island fly fishing guide? ​Contact Wild Angler today. 6427-346-6903. Casey Cravens has explored New Zealand's rivers and lakes, across both the North and South Islands, for 23 years. He specialises in the Dunedin, Gore, Queenstown and Wanaka regions--the Mataura River, Otago and Southland streams, and the wilderness rivers of New Zealand's South Island in Fiordland, Mount Aspiring and Westland. His fishing obsession dates back to a childhood in a hot dry land far, far away. For 28 years he's fly fished for a wide range of species--from Texas black bass and redfish to Rocky Mountain cutthroats, to Quebec's sea-run brook trout and Atlantic salmon. A few years back he spent six months in Chile and Argentina exploring the far-flung fisheries of Patagonia and improving his Spanish. Casey moved to Dunedin in 1993, where he raises two fine sons. He enjoys backpacking the South Island high country with camera and fly rod, sight fishing with a dry fly, and tying new patterns for hatch-driven rivers like the Mataura. A member of the New Zealand Professional Fishing Guides' Association, Casey is a brand ambassador for Thomas and Thomas Rods and on the pro staff of ﻿Einarsson Fly Reels﻿. He enjoys reviewing gear, writing, photography and giving talks on conservation, fly fishing traditions, techniques and destinations. "In Wildness is the preservation of the world." --Henry David Thoreau, "Walking"